Monitoring of hospital rooms such as operating rooms and isolation rooms for housing contagious patients is a typical application. 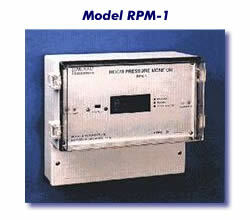 Other applications requiring differential pressure 'N'2 monitoring are: fume hoods, clean rooms, computer rooms, asbestos abatement projects etc. This monitor is extremely sensitive and performs reliably at very low room pressures. It is easily mounted on a wall and the installer has the choice of rear or bottom knockouts for electrical and pressure connections. All electrical and mechanical components are housed in a tough polycarbonate NEMA type 13 (IEC529, IP65) enclosure with a clear, gasket polycarbonate cover for easy viewing of display and room status. those approaching of the status of the room. The pressure at which the lights change state can be adjusted from the front panel. are proportional to the room pressure. A selector switch allows field setup for either 120 Vac or 240 Vac 50/60Hz service. 24 Vac operation is optional. Standard range: +-0.1 inches of water (or +-25Pascals). Resolution: 0.001" of water (or 0.1 Pascal). Panel indicator lights: one red & one green LED. Alarm output: SPDT relay, contacts rated at 5A at 30 Vdc or 120 Vac, 4A at 240 Vac, resistive. 4 - 20mA sourcing, l2mA at zero pressure, max loop resistance is 580 Ohms. Max power consumption: 5 Watts. Electrical connections: 3/4" terminal strip with # 6 screws. Operating medium: air or non-corrosive, non-explosive gas. Maximum momentary pressure limit: +-6.0 inches of water (+-kPa). Operating temperature: 0oC to 50oC (32oF to 12oF). Storage temperature: -30oC to 70oC (-20oF to 160oF). Effect of temperature on reading: +-0.05%/oC. Operating humidity range: 10% to 90% R.H. Physical dimensions: see outline drawing.